Control the light and heat that enters your room using only the power of the sun. Our innovative design is operated by remote control and requires no wiring and no electrician. VELUX solar blinds are available in blackout and light diffusing versions and in a variety of stock and custom color options! All qualify for a 30% federal tax credit. 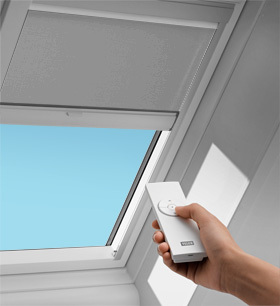 All blinds listed on this site for for Velux skylights from 2010 and newer. Please call us at 1-800-900-0759 if you are looking for blinds made for skylights older than 2 years as they are no longer manufactured by Velux and extremely limited in availability. Whether you choose a blackout blind to block the light or the light diffusing shade to eliminate glare, you'll can choose just what you want to put the perfect touch on your skylight and your room!